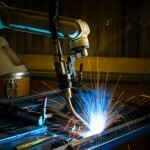 With the increased productivity and wire consumption that automated and robotic welding technology bring, there also comes higher levels of welding smoke and fume. Robot accidents can occur during non-routine operating conditions, such as programming, maintenance, testing, setup, or adjustment, when unintended operations could result in injuries. Air Purification Inc. has proven solutions to help you collect the smoke and fumes from welding cells. Premium welding ventilation hoods collect welding smoke and fumes, even oily welding smoke, right at the cell with no ducting needed. Guidelines For Robotics Safety. STD 01-12-002 [PUB 8-1.3], (1987, September 21). Provides guidelines to OSHA compliance officers, employers, and employees for the safe operation and use of robots and robotic systems.